Neumann was a pioneer of the application of operator theory to quantum mechanics, he is considered a founding father of modern computer design which is still referred to as the von Neumann Architecture. The famous mathematician Neumann János or better known as John von Neumann (1903-1957) was born in a Jewish family in Budapest, Austro-Hungarian Empire. He received his Ph.D. in mathematics from Pázmány Péter University in Budapest at the age of 22, at the same time earning a diploma in chemical engineering from the ETH Zurich in Switzerland. Between 1926 and 1930 he taught as a Privatdozent at the University of Berlin, the youngest in its history. By age 25, he had already published a dozen of major papers. John von Neumann emigrated to the United States in 1930, where he was invited to Princeton University, and he was one of the first four people selected for the faculty of the Institute for Advanced Study (two of the others being Kurt Gödel and Albert Einstein! ), where he remained a mathematics professor from its formation in 1933 until his death. Von Neumann was an important figure in computer science. The use of memory in digital computers to store both sequences of instructions and data was a breakthrough to which von Neumann made major contributions. In 1945 von Neumann wrote an incomplete set of notes, titled the First Draft of a Report on the EDVAC. This widely distributed paper layed foundations of a computer architecture in which the data and the program are both stored in the computer’s memory in the same address space, which will be described later as von Neumann Architecture. This architecture became the standard for a long time and is still used today. As a result of these techniques and several others, computing and programming became faster, more flexible, and more efficient. Next to computer science he reached breakthroughs in many other fields. His work on the Manhattan Project was crucial to the development of the first atomic bomb, and he was a key designer of the first US intercontinental ballistic rockets. Von Neumann also created the field of cellular automata without the aid of computers, constructing the first self-replicating automata with pencil and graph paper. Later, his interest inmeteorological prediction led him to manipulate the environment by spreading colorants on the polar ice caps to enhance absorption of solar radiation, thereby raising global temperatures. In 1956 von Neumann wrote his (posthumously published) book The Computer and the Brain, in which discusses how the brain can be viewed as a computing machine. The book is speculative in nature, but discusses several important differences between brains and computers of his day as well as suggesting directions for future research. Memory is one of the central themes in his book. 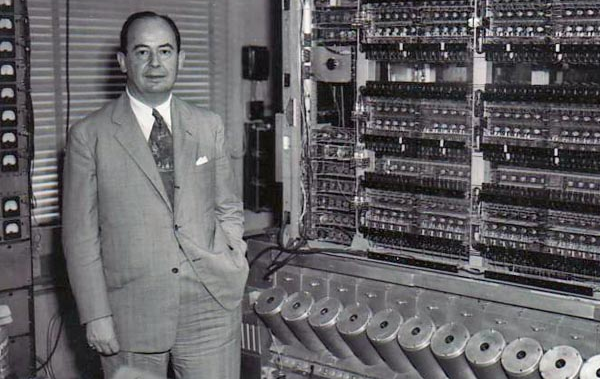 John von Neumann died of cancer in 1957, aged just 54. A tragically early age for the world to lose one of the true giants of twentieth century science.